Mind mapping is an effective way to express your thoughts and analyze new ideas. With Mind Mapping, you can connect different ideas in different ways. You can be creative with your ideas. You begin with a big concept and gradually narrow down the concept into smaller concepts. You can visualize mind mapping as a tree structure where the bigger concept is the trunk and other smaller concepts are branches, twigs and leaves. Thus, you can easily connect to the bigger idea via any branch, twig or leaf. 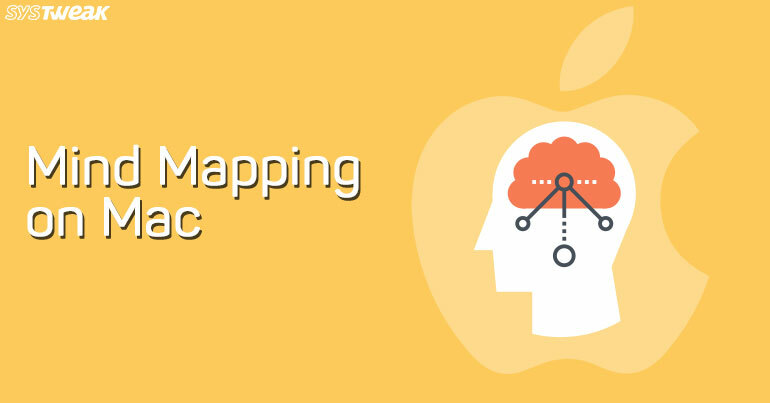 In this article, we’re discussing about the best mind mapping software for Mac OS for better brainstorming. Read On! A mind mapping software should be able to read chaotic ideas and present them neatly. The most important quality of a great mind mapping tool is to present the most chaotic ideas in a visually organized manner. It means that a mind mapping tool should transform conceptualized ideas into an organized mind map. It should also include features like collaborating the whole team. However, an individual user doesn’t need to work with the team. Choosing a mind mapping software entirely depends upon your requirements. One person’s favorite app can be a NO for another. Therefore, it’s recommended to try different apps among the best ones to find the app that suits your requirements. Hence, we will discuss about 6 best mind mapping software for Mac OS. Some are free and rest of them have free trials. Check them out! Note: – It’s hard to find and declare the best apps for mind mapping as there are good number of tools available on the Internet. The software discussed below are feature-rich. We are sure that you’ll find the perfect one for you! XMind 8 has three different pricing plans- XMind 8 Pro ($99), XMind 8 Plus ($79) and XMind 8 basic (free). We recommend you to at least choose XMind 8 Plus to use the software to the fullest. Let us tell you why? You can design maps with the free version but can’t export mind maps to different formats. The Plus plan allows you to export mind maps and Pro edition provides you features such as Brainstorming Mode and Presentation Mode. Hence, you can share your ideas in the form of presentations with your teammates and make creation easier. Moreover, you can use XMind 8 Cloud to sync mind maps on different devices and between your colleagues. Short and sweet, XMind 8 is an easy to use, powerful mind mapping tool that you may like. Click here to download XMind for Mac. Mindomo is an efficient mind mapping tool that is flexible and feature-rich at the same time. Moreover, the app offers 30-day money back guarantee if you don’t like it. Therefore, you can try it at least without the fear of losing your money. FreeMind is an open source program for Linux, Windows and Mac OS. It’s free, powerful and flexible. The ‘follow’ link operations and single click fold/unfold feature makes FreeMind faster than MindManager. You may find it a little less intuitive and user-friendly than its contenders. FreeMind is perfect for solo users. You will love FreeMind if you don’t care much about UI and think that other tools just provide basic features due to paid plans. Click here to download FreeMind. MindNode has an aesthetic user interface that you’ll fall for. The software costs $29.99 and the solution just provides the necessary features that can be used for brainstorming new concepts and organizing them into a mind map. Genuinely, we find MindNode as the most relevant mind mapping solution in the league. MindNode contains features such as iCloud syncing and VoiceOver Support. It has also got an Apple watch feature that you seldom see on other platforms. Hence, if you’re completely devoted to Apple products, you should take this software home. Click here to download MindNode for Mac. Scapple is the perfect tool for writers who are trying to outline their projects. The developers of Scrivener, the writing app designed Scapple to develop mind maps efficiently even for complex processes like writing a book. You can put your scattered thoughts and view them in an ordered manner via Scapple. It provides a free trial for a month and then you can buy Scapple for $14.99. The free trial version will not work after 30 days of use. It means that you can use it continuously for 30 days or use it for two days in a week for 15 weeks. Click here to download Scapple. MindManager is designed for enterprises. The tool is a favorite for big companies like P&G and syncs well with MS Office Suite. It is available for both Mac and Windows. The Mac software will cost you $149. It offers a 30-day free trial period. As the tool is created for enterprises, it’s powerful, efficient and more expensive than others in the pool. Therefore, both small team and a fortune 500 executive can use the software. Majority of the users won’t be interested in enterprise-oriented mind mapping solutions. But if your team requires to collaborate with bigger companies, especially when they are using MindManager, you can certainly try it. Click here to download MindManager for Mac. Mind mapping is a great method to brainstorm and calibrate new ideas. Though you can perform the process with a pen and paper, this software can really keep your ideas safe and secure. It is easier to lose paper sheets than digital files. Plus, it saves time and makes the work look less bulky. The list is not exhaustive as there are many apps available out there. Till now, these are the 6 best mind mapping software for Mac. we will update the list as soon as we come across new tools in future. For more amazing articles, subscribe us!